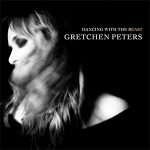 Following her appearance at Celtic Connections this coming January, Gretchen Peters will be heading out for the Transatlantic Sessions and then returns to the UK in April for the Strings Attached tour which will see her playing a run off dates with her band and the Southern Fried String Quartet. The Strings Attached tour will include gigs across the country at venues including the Gala Theatre in Durham, Manchester’s Royal Northern College of Music and Cadogan Hall in London amongst many others. Find all of Gretchen’s upcoming tour dates listed below.